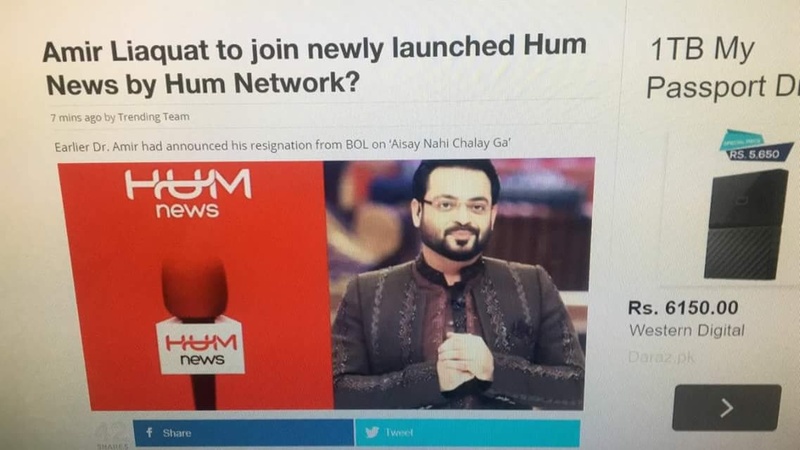 Aamir Liaquat Hussain resigned from Bol Network last night during his show ‘Aisay Nahi Chalay Ga’, saying that he won’t be seen on Bol again. The news was announced by the anchor/entertainer on 14th August, during the special transmission of Bol News for Independence Day. It was a surprise announcement by the anchor and the Bol News transmission was terminated immediately after he announced his resignation on the set. The transmission was cut off immediately. He gave the impression of apologizing for his words which might have hurt someone. The former member of National Assembly was serving as the Executive President BOL News Network when he decided to part ways with them. There has been no news from his official Twitter handle, however, his own statement on live transmission indicates that he has left Bol Network for good. We’ll continue to update the story as more details come in. So he will be doing Eid Transmission on Geo than? +1 nice. Yes he is a clown. Even an animal like a Pig is better than him. He just has a big, vulgar and cheap mouth. Yes bosses. I completely not forgetting agreed. He had been an intolerable man. Now is non-professional too. Not just intolerable/non-professional But he is a pervert and a womanizer too! Trust me, he was cursed to BOL TV, just because of him, BOL TV progress paused and stand still, in fact it was drowning. Now we all hope that BOL TV will rise again. 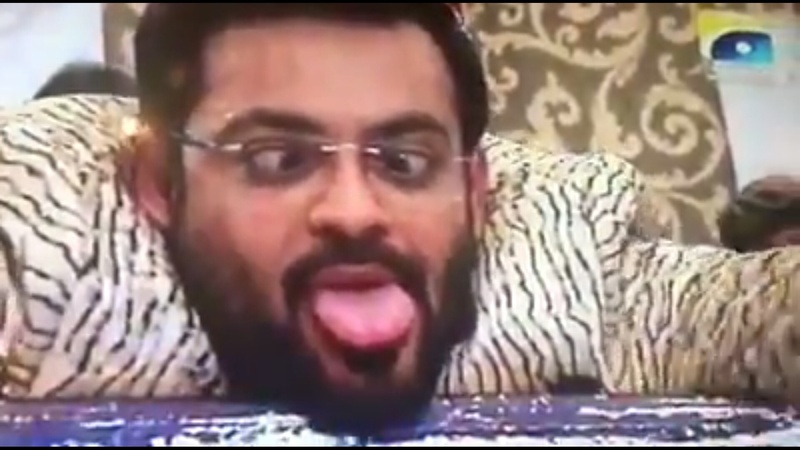 Mr Amir Liaqat was a jack of all trade and master of non. neither he was journalist nor the scholar, he was just a filthy political worker who only can spill the dirt to others and extremely criminal minded and extremely controversial. I wish BOL TV would have took Mr Mubashir Lucman on board as a CEO & President of BOL TV. Aamir Say Clearly everything without showing victim named. This working is good need more attention. +1 sane people still exist! I really cant understand who watches this aamir joker. His fans are also retarded like him. MQM ke workers filthy he hote hain bhai. Nothing new. BOL TV will rise again? Something that was started with money from corruption (fake degrees’ selling) should rise? Do you even know perks they are giving to their employees? From where are they generating funds? How can you even wish good luck to such an “organization” …then if some dacoits start a hypermarket in your city should not be an issue for you…why politicians are made accountable when generals and a channel back by them isn’t ? If HUM is a descent channel they wont offer him. No Journalism background. just shouting and blaming everything on Geo. +1 Aamir is filthy just like Altaf Hussain. Acha Hua, Warna BOL Media Group ko aik New musebat me dalta ye. Just because of Amir liaqat’s show I subscribed to BOL TV, now he leaving the channel creating a vaccum !!!! BOL TV ? Is it the same channel which came into existence from the fake degree scam? Agar ab ye phir Geo main gya to bhai awaam ko chappaloun se maarna chahiay issay. Suna to tha k Hum ka news channel aa rha hai. Ho sakta hai wahin ja rha ho aur ziada achi salary pe. Great police work bhai. Really you sharp like dog yet u look like man. Biggest AC of you from Pindi. Replace the letter ‘p’ with letter ‘L’. You will have your reason. Please watch HUM from now on. A little correction needed in your comment. He used to be active here in comments, but lost since long. Aamir Liaquat started with Geo. Then went to ARY. Then back to Geo. Then left Geo for Express. Then came back to Geo. Then left it for Bol. Now resigned from Bol? What is this man doing? it not good that Amer you at last played eithenic and lauguagte cards. we used to watch your programme very happily and liked the way to project Two nation theory. Kashmir issue and exposed anti Pakistan channels and elements. Sad on knowing the reason u made to left Bol. Please come out of this language barriers. Be Pakistani first. If you leave like this it will prove that you still have MQM stamp on you and lauguagtic supporter. Hope no one has threatened you on your vocalness and you made this as way out. ??? He was on specific agenda to utter filthy words on current government. Since the objective is achieved he is gone. Soon u will see similar changes in ARY too. Stupid paid so called anchors. KIA sahafat ka kirdar kisi ki kirdar kushi karna ha ?